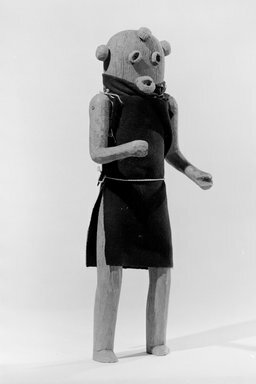 Mudhead kachina doll with 4 knobs on head, protruding eyes and mouth. Dressed in a black cloth dress tied around the waist with string and a black scarf around the neck also tied together with string. The arms are carved separately and attached with nails. The body is painted in purple-brown paint. Condition: Good. Nail holes in the bottom of the feet, probably from a previous mount.